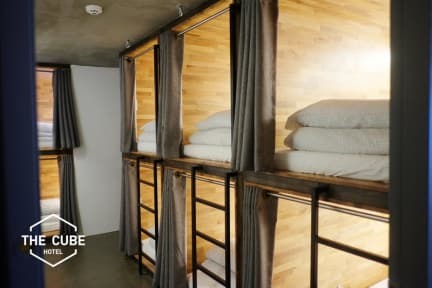 The cube hostel was in an ideal location in myeongdong. It was not on the side of the street where the shopping area was, which meant it was quieter, even though it was only a 5 minute walk to shop. It is around 10 minutes walk to the Namsan Seoul Tower cable car too. The rooms were very safe as there is a pinpad for the sleeping rooms. It was super quiet in the rooms, so we met outside in the common area to chat. Breakfast was also provided - eggs, tea, coffee, bread, ham, cereal. Loved this hostel. The location was great and right next to a subway station. The cubes were private and quiet, and the facilities were always clean. Loved the friendly and helpful staff and the lovely common room. Would definitely stay again. Love this hostel. I had a blast. The location is central with many options for food and shopping, making it easy to get anywhere you want to go in Seoul. Loved the people we met there and the cubes were private. Great value for the price. I was very comfortable and felt safe staying at The Cube! It’s conveniently located and had everything I needed during my stay. The cubes are cozy and warm, especially after walking outside in the cold for most of the day! Thanks for a great visit to Seoul. A lovely hostel with a very warm and cosy feeling. Nice communal space. Really nice bathroom facilities and towels. The room was cosy, quiet and dark in a good way. 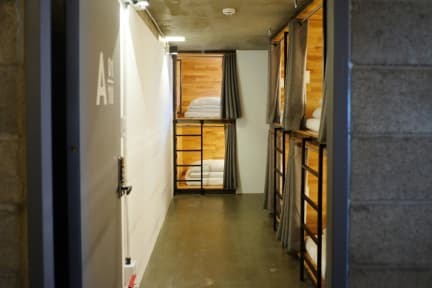 The cube was solid, nice thick curtains, comfortable mattress, light, power points and plenty of space. Breakfast was nice. Hostel was very close to the subway and the Myeongdong shopping area, which had a bunch of bars and restaurants. Staff wasn't helpful when I asked for restaurant recommendations, or bath and spa houses. I ended up just using google for everything. This was the worst aspect of the hostel for sure Bed was comfortable and pretty spacious pod. Good location with easy and close access to MRT, buses and Airport limousine. It is also easy access to Myeong-Dong Night Markets and shopping Street. Hostel facilites are clean.